The most updated national soil information can only be obtained from a country’s national soil service. However, International organizations such as FAO, ISRIC World Soil Information, the Joint research Centre of the European Commission and others have compiled and harmonized national soil information in regional datasets or made soil maps available in digital format. 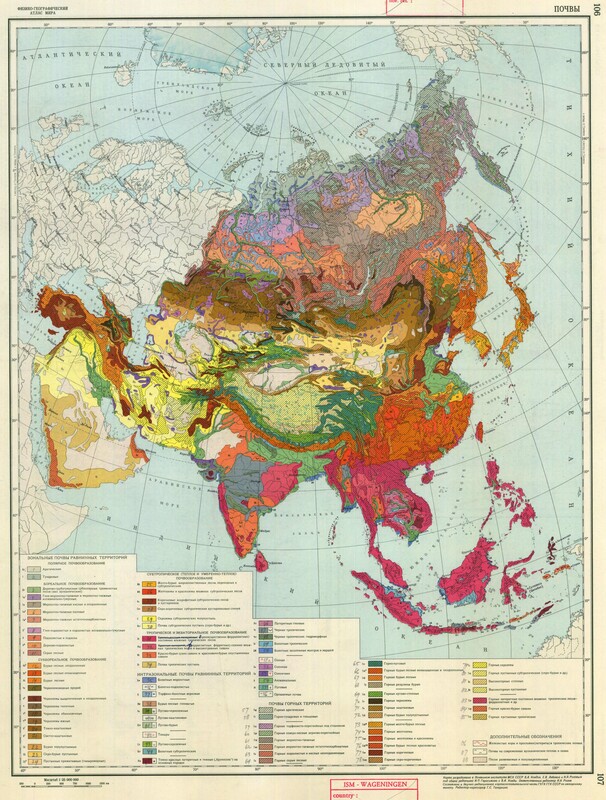 In a second phase, 1030 maps of the Asian continent pertaining to soil and related studies were added to the EuDASM archive. The soil and physiographic database for north and central eurasia covers China, Mongolia and all countries of the former Soviet Union. The soil information has been derived from several sources, in particular the 1:2.5M Soil Map of the Former Soviet Union prepared by Friedland in the Dokuchaiev Institute, Moscow; and the soil map of China at 1:4M prepared by the Soil Science Institute of the Academia Sinica in Nan-Jing. All soil information has been correlated with the Revised Legend of the Soil Map of the World. SOTER forms a part of the ongoing activities of ISRIC, FAO and UNEP to update the world's baseline information on natural resources. The project involved collaboration with national soil institutes from the countries in the region as well as individual experts. The Soil and Terrain database (SOTER) for Nepal, at scale 1:1 million, is a generalisation of Nepal's Soil and Terrain database (1:50 000) compiled in 2004 by FAO and the Survey Department of Nepal. ISRIC- World Soil Information compiled the database using the SOTER methodology. Much of the discrimination and characterization of the SOTER units is based on a former land system survey, complemented by data of the 90 m digital elevation model (DEM), derived from Shuttle Radar Topographic Mission. The SOTER information is presented in ArcGIS9.3® and in ArcView 3.3® format, while the attribute database is in tabular MSAccess® format. The ASRIS map window provides access to a Geographic Information System via the web. The maps are created in response to the settings you specify with the buttons and selectors. Map layers are the different sets of information that can be added to your map. The system can add and subtract layers from the map according to the scale. This stops your map becoming cluttered with lots of fine detail when large areas are being viewed. S-map provide a seamless digital soil map coverage for New Zealand. S-map is designed to be applied at any scale from farm to region to nation. Existing soil databases are patchy in scale, age and quality. Many maps do not adequately describe the underlying properties of the soil types they represent. S-map integrates existing reports and digital information and updates soil maps where existing data are of low quality. The goal is to provide comprehensive, quantitative soil information to support sustainable development and scientific modelling. This unit of NARI provides technical advice on Geographical Information Systems and produces maps that when retrieved and manipulated can enable one to have a “birds eye view” of natural resources and agricultural practices or crops grown in different parts of the country. There are three major agricultural databases kept at NARI. These databases are available in a Geographical Information Systems format or simply map-linked databases. They can be presented as maps, tables and graphs.These databases are relevant to Researchers, Agriculturalists, Planners, Investors, Environmentalists, Schools and Universities or to anyone involved in planning development and land management in PNG. Soil and Terrain Database, Land Degradation Status and Soil Vulnerability Assessment for Central and Eastern Europe (SOVEUR). This FAO CD-ROM includes a harmonized soil and terrain database for 13 countries in eastern Europe at 1:2.5M, compiled following the SOTER principles, including geo-referenced soil profile data. The report “Soil Resources of Europe” provides the most comprehensive summary of the current position regarding the detail and availability of soil information, particularly spatial data, at national and European levels. It provides links to more detailed information and national soil institutes. "The result of a three-year collaborative project with partners from northern EU countries, as well as Norway, Iceland, Greenland, Canada, the USA and Russia and gives a detailed overview of circumpolar soil resources relevant also to agriculture, forest management, water management, land use planning, infrastructure and housing and energy transport networks." The atlas can be downloaded as PDF but unfortunately not the GIS coverage.